The captain of the girls’ lacrosse team, Lucy lived lacrosse, giving her all on the field and in the sidelines – and in her life. She was loved and respected by team mates, her peers and everyone around her. Having grown up in Waldorf education, Lucy was committed to High Mowing and its important intangibles. As her place in our hearts grew, she matured to a sunny, socially graceful and multi-talented young woman. Desiring to expand her knowledge of healing alternatives, she undertook the topic in her senior capstone. 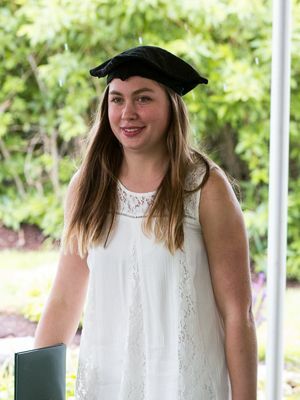 Lucy will spend a gap year working in her father’s hardware firm in her hometown of Jay, New York, building a tiny house and travelling to Europe with sister Molly ’14 after which she will study biochemistry at Warren Wilson College, in North Carolina. After earning her BS, Lucy plans to attend naturopathic school.